UPDATE Oct. 2016: The UC essay questions have changed! Many students are quite interested in applying to one or many of the campuses within the University of California system (or the “UC system” for short). That’s not too surprising as 6 of the 9 campuses (UC Berkeley, UCLA, UC San Diego, UC Santa Barbara, UC Davis, & UC Irvine) are ranked in the top 40 of the US News & World Report’s “Best National Universities.” The UC system has always had one main application that all the campuses share. Incoming freshmen must respond to two essay prompts on the UC application in order to apply for undergraduate admission. Each applicant must respond to both essay questions within a maximum of 1000 words total. These words may be allocated as the student wishes as long as the shorter one is greater than 250 words. When my students read these prompts, they usually look dumbfounded and then start to slowly ask all the questions that come into their heads. Because these questions tend to be repeated each year with my new set of students, I thought you might benefit from some of the answers. Anytime an essay question confuses you, break it down into parts so that you understand everything it’s asking. The writers of these essay questions usually add words and ideas that they think will help the student start brainstorming. 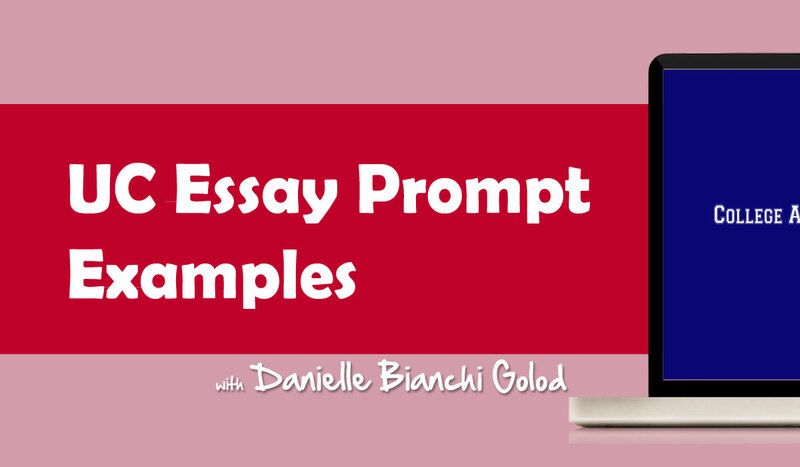 A prompt is an essay question. To summarize, #1 is really asking WHO WILL YOU BECOME? It wants to know how your surroundings—the people or the environment–have helped shape who you want to become. Often students can relate to this one by thinking about why they have chosen a certain path—Why have they decided to study a certain major and want to become an engineer, a doctor, a psychologist, a social worker, a business executive, an English teacher, a politician or a church leader? What/Who made them want to become an athlete, an artist, a singer, a cook, a journalist? To summarize, #2 is really asking WHO ARE YOU NOW? It wants to know how some experience or quality or characteristic really describes who you are. Here you want to show a personality trait through an anecdote. This one will be more related to your personal statement on other applications. You’re right. You don’t want to spend time in an essay TELLing anyone who you are. That is why they followed up that question with “…how does [this quality, talent, accomplishment] relate to the person you are?” They want you to describe the type of person you are by through SHOWING them through example. No, the UC (or any college for that matter) does not want a laundry list of all your extracurricular activities. Save those for the right section on the application. Generally, one essay can become your personal statement for other applications. Since almost all personal statements on other applications give you a 500-600 word count limit, make this one your longer one. Your other one would be around 300-400 words. You can allocate the words as you wish. In my experience, students have chosen one to be 500-600 words and one to be 300-400 words. This information actually helped me a lot. I’ve been pulling my hair out just wondering how the heck I’m going to write my essays but this page has actually got some ideas going in my head. THANX SO MUCH. So glad to hear it helped you! Good luck on college responses! Hi, how do we get tutored from you? I need to practice writing a personal statement for my AP English class but I don’t really know how to start and where to begin. Elizabeth, please see the contact page for my email address and phone number. I am currently writing a personal statement for my AP English class and i am really stuck. Can you write one without giving out too much personal information? see the contact page for my email address and phone number. Wonderful news, Marisa! Glad to hear you gained your needed confidence. I wish you luck on your responses from colleges! For prompt #1, is it very important to link your aspiration to your intended course of study? i would like to major in Sociology but i dont know what to write for prompt one. Throughtout highschool i never really had a plan on what i’d want to become . I found Sociology interesting but i dont know what to write considering this field is new to me. HELP ?! Can you write about the person you will become in general for Prompt #1 or does have to be about the type of person youll become for your specific study? Yes, writing about the person you want to become is a good answer. If you can show how a potential major(s) might aid in that career path or path to success/happiness…that would be a bonus. Also, have you written an essay already for the Common App or Apply Texas app by chance? Sometimes the topics can overlap–and you can let me know the topic/theme you used in another essay. your web page has been a great resource to start my personl statement (: i was wondering where can i contact you to ask ou some private questions? I was looking up ways tow write my personal statement and came upon this website. Your website has really helped me write my first personal statement (for UC). Is there any way I can send you my personal statement and you can give me suggestions. Thank You. Hi Danielle it really helped me out. Im working hard on prompt 1. Can you tell me what my approach should be. I reall want to be an Economist in the future. how should i link this inspiration with my school or my WORLD. Have you taken any classes during high school that relate to economics? Did you shadow/intern with an economist? Is there someone in the family/teacher who helped you decide this path? Are you a member of a club that discusses issues related to the economy? What inspired you to want to be an economist? I think 750 for Prompt #1 is good–that seems to be more the norm. If you can edit more words, however, I think the 2nd prompt would be better with at least a 300 word response…so shoot to make it more 700/300. Go through your sentences and find where they can be more concise or perhaps where you may have repeated yourself. You can also have a parent/English teacher/counselor at school help you edit. That all depends, Emily, what is your accomplishment and what quality are you trying to portray? Hi Alondra! I’m so happy to hear that. This helped so much with my essay for prompt #1. Do you have any advice on how to make prompt #2 sound humbling rather than arrogant for how a talent or personal quality made me proud? Thank you so much! First off, the UC does say that these prompts are a chance to brag about yourself as they don’t know anything about you otherwise. Instead, talk about how you were surprised how much you learned, how happy you were to understand a new perspective after accomplishing your feat, or why you look back on the person you were and how far you’ve come and how proud you are of yourself now. You can also SHOW how proud you were/are by describing a parent, friend, teacher, or coach congratulating you…and how you smile and nod your head. The reader can then understand that you’re proud too. Hi i was wondering if anybody could give me ideas or examples on what to write my second personal statement on. Its for my college applications and today’s the last day that i have to write it because the dead line is tomorrow please help me!!!! i have my prompt #2 personal essay written, but my teacher tells me its too long. can i send it to you in an email and tell me how to shorten it? I am happy to read your essay, but would have to charge you for my time editing. I will write you directly. Thanks for the article! It was very helpful during my writing process. Do you offer personal editing resources? That would be even more helpful. Thanks again! I am working on my uc davis prompt application and i am confused and would like your help. Thanks so much for writing. What is the confusion? What to write about? What the prompt is asking? Let me know some specifics and I can help you more effectively. Hey I just wrote my personal statement prompt 1. It’s my first draft, but I’m not to sure if it’s good. Can you help me in any way? Bty, amazing website! It’s because of this website I was able to write something down. I’m so glad you liked the website and I am glad it helped you. I do read students’ essays and would just charge for my time editing. I will email you directly. Your information is really helpful. But I was wondering if for prompt 1, since we have to talk about the world we come from I can talk about how I am an undocumented student & how at some points in my life I find myself having everything so much harder than the olpeoplr surrounding me? Your information is really helpful. But I was wondering if for prompt 1, since we have to talk about the world we come from I can talk about how I am an undocumented student & how at some points in my life I find myself having everything so much harder than the people surrounding me? Did you go through the Personal Statement Blueprint? And did you think of ideas? Or did you write a draft of your essay(s)? I’ll also send you a personal email. I would start to think about what made you decide that you would like/benefit from a Comp E style major. Have you shadowed a computer engineer before? Is someone in the family a computer engineer? Have you taken any classes at school that relate? Or joined any clubs/enrichment programs that led you down that path? Think about WHY you have chosen this field. It can also help to look up the Comp E programs at the UC’s that interest you–you can find descriptions of the majors, the classes, often even bios of teachers you can email to ask questions. I need you to be more specific…Common App #1-#5 essays? UC Prompts #1, #2? Undergraduate app? Graduate/Transfer app? public university app? Are you having trouble with what to write or how to write it? Thank you so much for the advice you have given through this post. I have made a few revisions after completing a draft of my Prompt 2 essay and was wondering if you could e-mail me to take a look at it and give feedback. I am also struggling to not restate “the world I come from” in Prompt 1 with the experience I wrote about in Prompt 2. Hope to hear from you soon. Thank you so much for the tips! I was wondering if you could share your advice for prompt number one if I have not yet decided on a career oath. I’m really struggling to figure out what to write! Thank you! I find UC Prompt #1 is really asking “Who will you become?” This can be the major you will choose or the career path you choose. Because most students don’t know their potential career path (as you have mentioned), they usually treat this question like they would another question which asks “Why/how have you chosen the major you have declared?” that we find so often on many university applications these days. Do you know what major you are choosing and why you are choosing it? Let’s start there. I would like you help on personal statement. How can I contact you. I just emailed you directly. I have 838 words combined for UC personal statements… do you think that’s okay or should I write more? That completely depends. As you know, one must be at least 250 words. My students tend to write one closer to 350-400 and one at 600-650, but that is by no means a rule. If you feel like the admissions readers can get a great feel (and great range) of who you are by reading the 2 prompts at the length you have them, then the essays could be fine. Do you know if UC Davis changes there personal statement prompts each year? I am a college freshman and want to get a head start so I can perfect my personal statements. No the UC’s did not change their prompts this year, and in fact opened their app on Aug 1st–so you can definitely get started! My English teacher wants us to writing a personal statment. I want to be a psycholoist but I still don’t understand what are the prompt 1 really mean’s to me. I still don’t make any sense of it can you explaint specific for me ? Please. Have you had any practice writing answers to any other prompts for college apps and you are struggling with the UC one? Or have you never started writing one before? Things to know about your personal statement essay and how it can be used for multiple applications. I’ll suggest which essay prompts can have similar answers. (This obviously depends on your stories, but in general, you can use this guide). I’ve filled out my Apply Texas A & B. Can I use them for the UC’s or the Common App? #1 Some students have a background story that is so central to their identity that they believe their application would be incomplete without it. If this sounds like you, then please share your story. #2 Recount and incident/time when you experienced failure. How did it affect you, and what lessons did you learn? #3 Reflect on a time when you challenged a belief or idea. What prompted you to act? Would you make the same decision again? #4 Describe a place/environment where you are perfectly content. What do you do or experience there, and why is it meaningful to you? #5 Discuss an accomplishment/event, formal or informal, that marked your transition from childhood to adulthood within your culture, community, or family. I am having trouble trying to brainstorm ideas to write for UC prompt #1 because I am doubting myself on if the topic is good enough to write about. Ever since I was little I always loved animals so I wanted to write about how I accidentally killed my bird and how it has shaped me as a person and how it affected my dreams to go into the medical field to help people but I dont know if its focusing enough on the “world I came from” or focusing on family community or school. Could you please give me some advice on what I should do? It would be greatly appreciated! How did you kill your bird? And I get the transition to medicine (esp if it were veterinary! )…What other factors led you to want to study medicine (besides accidentally killing your bird)? Classes at school? Doctor in the family? The way a teacher taught a bio/chem/physics class at school? YouTube videos you’ve watched on surgery? Outside/enrichment programs/classes? Opportunities you’ve taken to shadow someone in the field? Internships/jobs you’ve had that sparked an interest in science/medicine? These would all discuss the “world you come from” influencing your goals to pursue a degree/major in science/med. I have just finished writing my common application essay, which answers Prompt 3: Reflect a time when you challenged a belief. In my common app essay, I start off by describing ‘my world’ and later talk about how my volunteering in a foreign country and internship helped me consolidate my aspirations. So I was wandering how I could incorporate this essay to the UC essays? The common Application essay is just above 650 on word count and I believe the UCs ask for no more than 1000 words for both essays? So what was the time you challenged a belief? Yes if you write about your world and aspirations, then for sure it works with the UC prompt. You can even keep the word count at 650 if you can make the other one 350.